Gluchowski, D. C.; Pearce, S.; McKee, L. J. . 2012. Sediment Characteristics of Managed Flood Control Channels in Southern San Francisco Bay. D, Y. 2012. Selenium Fractionation and Speciation in Final Effluents of Selected San Francisco Bay Area Municipal Wastewater Treatment Facilities. San Francisco Estuary Institute: Richmond. Fitzpatrick, J. 2012. Water Quality Modeling in Estuaries: Lessons Learned. San Francisco Estuary Institute. 2011. 2009 Annual Monitoring Results. SFEI Contribution No. 629. San Francisco Estuary Institute: Oakland, CA. RMP. 2011. 2011 Annual Monitoring Results: A report of the Regional Monitoring Program for Water Quality in the San Francisco Estuary. San Francisco Estuary Institute. 2011. 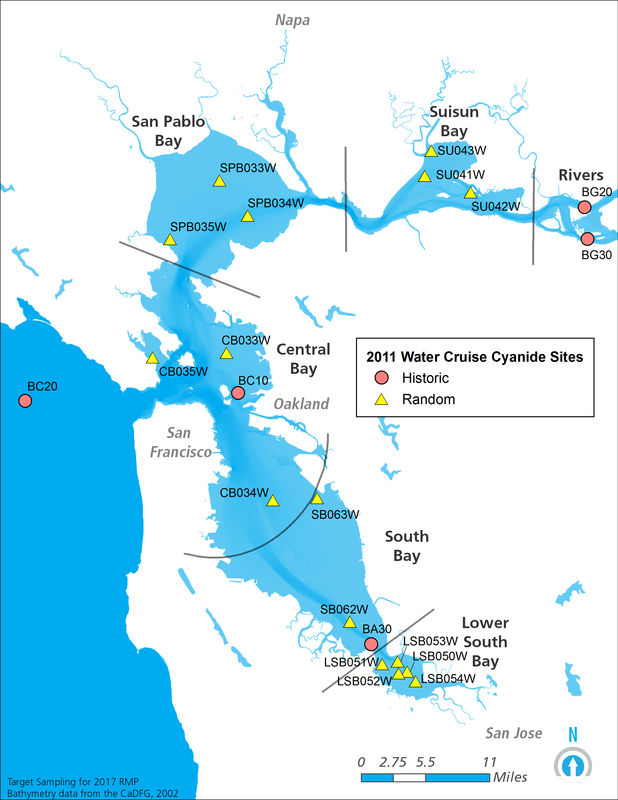 2011 Water Cruise - Cyanide Map. Rattner, B. A.; Lazarus, R. S.; Heinz, G. H.; Karouna-Renier, N. K.; Hale, R. C. 2011. Apparent Tolerance of Common Tern (Sterna hirundo) Embryos to a Pentabrominated Diphenyl Ether Mixture (DE-71). USGS-Patuxent Wildlife Research Center: Beltsville, Maryland. Cayce, K.; Klatt, M.; Kass, J.; Williams, M.; Collins, J. N. 2011. Bay Area Aquatic Resource Inventory. San Francisco Estuary Institute. 2011. 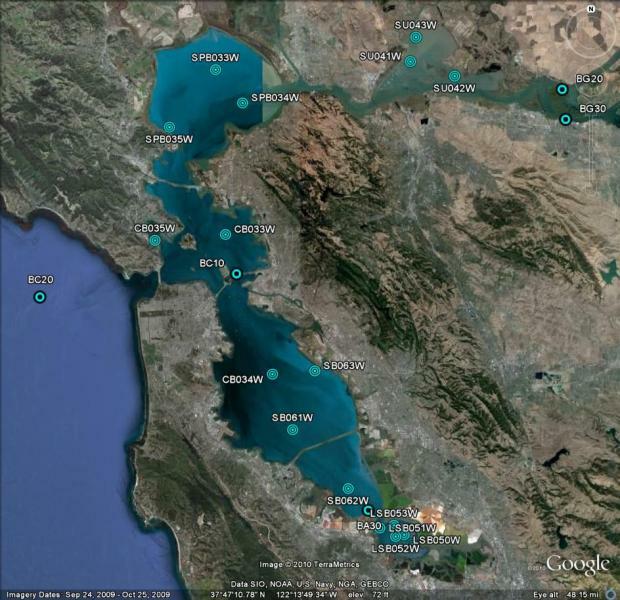 Bay Area Aquatic Resources Inventory (BAARI) . SFEI Contribution No. 746. p 79. Incardona, J. P.; Linbo, T. L.; Scholz, N. L. 2011. Cardiac toxicity of 5-ring polycyclic aromatic hydrocarbons is differentially dependent on the aryl hydrocarbon receptor 2 isofrom during zebrafish development. Toxicology and Applied Pharmacology 257, 242-249. Klosterhaus, S.; Allen, R.; Davis, J. A. 2011. Contaminants of Emerging Concern in the San Francisco Estuary: Triclosan and Triclocarban. SFEI: Oakland. Salomon, M.; San Francisco Estuary Institute; Costa, Cof Contra. 2011. Contra Costa County 1939 Aerial Photomosaic, GIS layer containing orthorectified historical aerial imagery of Contra Costa County from 1939. 2011. Copper 2011 Sample Locations Map. Lent, M. A.; McKee, L. J. . 2011. Development of Regional Suspended Sediment and Pollutant Load Estimates for San Francisco Bay Area Tributaries using the Regional Watershed Spreadsheet Model (RWSM): Year 1 Progress Report. SFEI Contribution No. 666. SFEI: Richmond, CA. p 126. Hintelmann, H.; Dimock, B.; Zhu, J. 2011. DGT (Diffusive Gradient in Thinﬁlm) as a tool to assess sources of bioavailable methylmercury in San Francisco Bay. SFEI Contribution No. 640. SFEI: Oakland. Ross, J. 2011. Dissolved Nitrate and Phosphate Concentrations in San Francisco Estuary Surface Waters: Spatial Distribution (2002-2009) and Temporal Trends (1993-2009). San Francisco Estuary Institute. 2011. Ecological Monitoring & Assessment Framework: Stream Ecosystem Condition Profile: Coyote Creek Watershed . San Francisco Estuary Institute: Oakland, CA. p 109. Gluchowski, D.; David, N.; McKee, L. J. .; Leatherbarrow, J. E. 2011. Estimation of Loads of Mercury, PCBs, PBDEs, PAHs, Dioxins, and Furans from the Sacramento-San Joaquin River Delta to San Francisco Bay. Lent, M. A.; McKee, L. J. . 2011. Guadalupe River Watershed Loading HSPF Model: Year 3 final progress report. SFEI: Richmond, CA. McKee, L. J. .; Gluchowski, D. C. 2011. 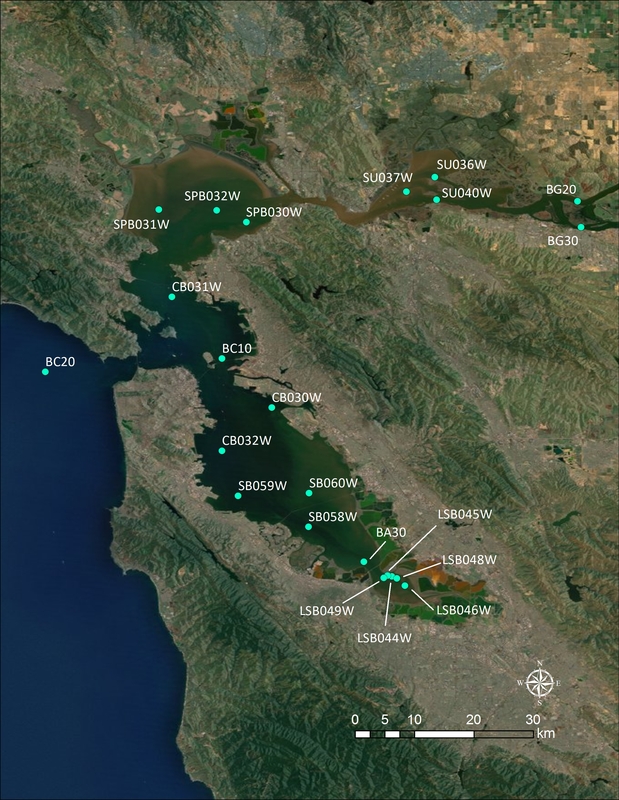 Improved nutrient load estimates for wastewater, stormwater and atmospheric deposition to South San Francisco Bay (South of the Bay Bridge). Gehrke, G. E.; Blum, J. D.; Slotton, D. G.; Greenfield, B. K. 2011. Mercury Isotopes Link Mercury in San Francisco Bay Forage Fish to Surface Sediments. Environmental Science and Technology. Gross, E. S.; Chang, S.; Holleman, R. 2011. Preliminary Simulations of Sediment Dynamics in the South San Francisco Bay. San Francisco Estuary Institute: Oakland, CA. Aquatic Science Center. 2011. The Pulse of the Delta: Monitoring and Managing Water Quality in the Sacramento - San Joaquin Delta. Aquatic Science Center: Oakland, CA. Stevens, D. L. 2011. Recommended Methods for Outlier Detection and Calculations of Tolerance Intervals and Percentiles – Application to RMP data for Mercury-, PCBs-, and PAH-contaminated Sediments. SFEI: Oakland. 2011. RMP 2011 Annual Meeting Agenda. San Francisco Estuary Institute. 2011. RMP Contaminants of Emerging Concern Profile: Triclosan. Gehrke, G. E.; Blum, J. D.; Marvin-DiPasquale, M. 2011. Sources of mercury to San Francisco Bay surface sediment as revealed by mercury stable isotopes. Geochimica et Cosmochimica Acta 75 (3), 691-705. San Francisco Estuary Institute. 2010. 2008 RMP Annual Monitoring Results. San Francisco Estuary Institute: Oakland, CA. SFEI. 2010. 2010 Pulse of the Estuary: Linking the Watersheds and the Bay. SFEI Contribution No. 618. San Francisco Estuary Institute : Oakland, CA. p 96. Ridolfi, K. 2010. Assessing Impairment of Tomales Bay due to Mercury. Ridolfi, K. 2010. Assessing Impairment of Wildlife by Mercury in Tomales Bay. Jabusch, T. W.; Grosso, C. 2010. Central Valley Monitoring Directory: Web-based Coordination Tool. Kelley, K. M.; Reyes, J. A. 2010. Characterization Studies of a Thyroid Endocrine-disrupted Condition in Wild Fishes of San Francisco Bay. SFEI Contribution No. 644. SFEI: Oakland. p 64. David, N.; Thomas, F. 2010. Comparison of Agricultural Runoff from Conventional and Organic Orchards. D, Y.; McKee, L. J. . 2010. Concentrations of Hg PCBs in soils sediment and water in the urbanized Bay Area. 2010. Copper 2010 Sample Locations Map. Collins, J. N.; Goodman-Collins, D. Darcie; Stalker, J. 2010. Data Collection Protocol Plant Community Structure of Intertidal--Upland Ecotone. Jabusch, T. W.; Bernstein, B. 2010. Delta Regional Monitoring Program. Aquatic Science Center: Oakland, CA. 2010. Desktop Evaluation of Controls for Polychlorinated Biphenyls and Mercury Load Reduction. SFEI Contribution No. 613. Eagles-Smith, C.; Ackerman, J. 2010. Developing Impairment Thresholds for the Effects of Mercury on Forster's Tern Reproduction in the San Francisco Bay. U. S. Geological Survey: Davis, CA. Schueler, T. 2010. Emerging Stormwater Pollutant Reduction Strategies from Another Urban Watershed: Importing Some Ideas from the Chesapeake Bay. Oram, J. J. 2010. Environmental Visualization Tools. Allen, R. 2010. Evaluating Potential Pathways of Perfluorinated Compounds to San Francisco Bay. Kelley, K. M.; Brar, N. K.; Waggoner, C.; Reyes, J. A.; Fairey, R. 2010. Evidence for thyroid endocrine disruption in wild ﬁsh in San Francisco Bay, California, USA. Relationships to contaminant exposures. Aquatic Toxicology 96, 203-215. Greenfield, B. K.; Klatt, M.; E., L. J.; McKee, L. J. . 2010. Exploratory categorization of watersheds for potential stormwater monitoring in San Francisco Bay. San Francisco Estuary Institute: Oakland, CA. Greenfield, B. K.; Bay, S. B. 2010. A framework and technical approach to address sediment indirect effects to human consumers of seafood. Committee, G. Bypass Pro. 2010. Grassland Bypass Project Report 2006-2007. San Francisco Estuary Institute: Oakland. Lent, M. A.; Oram, J. J.; McKee, L. J. . 2010. Guadalupe River Watershed Model: Support tool for regional Hg and PCB management. Ridolfi, K.; Micheli, L.; Vorster, R. C. 2010. Indicators and Performance Measures for North Bay Watersheds. San Francisco Estuary Institute: Oakland, Ca. Schiff, K. 2010. Lessons from Watershed Monitoring in Southern California.